Three angels are sent by Heaven to bring good to a world falling under the influence of darkness: Gabriel, the warrior; Ivy, the healer; and Bethany, the youngest and most human. They work hard to conceal their luminous glow, their superhuman powers, and their wings. Then Bethany meets Xavier Woods, and they are unable to resist their attraction to each other. But the angels’ mission is urgent, and dark forces are threatening. Will love ruin Bethany or save her? 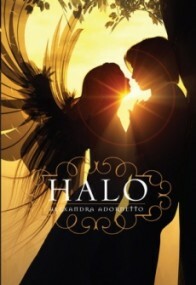 Angels and demons, love and romance, Halo has it all! I went to the library for another book but the cover of "Halo", which is absolutely beautiful, caught my eye and I decided to check it out as well. I read this book in a matter of hours and thoroughly enjoyed it! I couldn't put it down. Seeing the world through the main character, Bethany's eyes, who is an angel sent from Heaven to fulfill a purpose along with her siblings, Gabriel (yes, THAT Gabriel) and Ivy, was funny, heartwarming and at times heartbreaking. The reactions to Gabriel's presence from the females in the town was hilarious at times and I enjoyed the witty banter between he and Xavier. Ivy gets similar reactions from the young males in town and this works to her advantage in her efforts to raise awareness of social issues like poverty, elder care, feeding the hungry, etc. I know "Halo" hasn't gotten the best reviews which kind of surprised me, but then I realized why...it's not dark. I actually found it to be a breath of fresh air from some of the other books I've read recently. There are still the elements of good vs. evil, family, loyalty, friendship and of course the ill-fated love story but Adornetto presents it in such a way that it doesn't leave the reader feeling slightly depressed at the end. There was only one scene that I would take issue with and I question the ability of two teenagers, who put willingly put themselves in those circumstances to be able to exercise THAT much self control, angel or not. I fell in love with the cover , which is what drew me to the book. I had never heard of Alexandra Adornetto, but I decided to give it a try. The story line was intriguing to me. I do love a good Angel series. I just felt that I was not drawn to this particular story. Although it was good, I was hoping for something a little bit more that just was not there. That is why I gave this book a 3.5 star review…. unfortunately goodreads won’t allow half a star. Gabriel, Ivy, and Bethany (Beth) have been sent to earth on a mission. They have to bring good to the world in a time of darkness Being human is quite different and hard for them, and they find themselves struggling to make sense of it all. This was very new for me. The way Adornetto describes their struggles with their humanity was very interesting. I really like her view point. I found myself wondering how awkward I would feel arriving on an alien planet in a different form…… quite out of my element which is exactly how these three felt. Bethany was a character I struggled with. She seemed very insecure and impulsive half the time. I just could not relate to her. I just felt that she was so far gone by the first couple of chapters that she turned into a completely different person. She was way too clingy. I wanted to see more of a strong independent character. Instead, I felt as if I was reading about a young child instead of a proclaimed teenage angel. Xavier is the kind of boy we all fall for. Tall, handsome, and a jock makes every girl fall head over heels. Although he has suffered through tragedies, he seems able to overcome them all and still be that strong rock for Bethany. I will say I was kind of thrown off by his overstated love for Beth. It was just way too cheesy. I mean yeah we all want that knight in shinning armor around, but over obsessive guys are way overdone a lot of the times. He also seemed very full of himself which is another thing that threw me off. I love confidence in a guy, but being cocky and having a macho ego is a huge turn off. Their relationship was kinda cute and kinda nauseating. I loved the fact that they found true love in each other, but sometimes it was over obsessive. I could not see how someone could be happy in a relationship like that. I was very put off that she just kind off put everything off to be with him 24/7. I just felt that their whirlwind relationship made the book a little dull. The majority of the time it was touching base on how she could not live without him. About half way through I was screaming “I GOT THE PICTURE!” I did appreciate his loyalty to her. He seemed like the kind of guy to do anything and everything for her. JAKE THORN! OMG hello tall, dark, intelligent, and handsome. Ok I know I know he is the bad guy, but I was absolutely taken with him. I mean he is that bad guy I always hope for in a story. He had charm, was a romantic, and was super smart (O and he loved poetry!)….. SWOON! I was quite happy with his character. I am not sure how I felt about him raising up a demon spirit groupies, though. That part of this story was kind of underdeveloped. I would have liked to see more of an involvement with this group rather than the one short scene where they join up to ruin Beth’s life. Then the pieces of the puzzle that came together after this just seemed way too forced to me. It was really just thrown in there. I think this was a really good idea, but I am not sure I was happy with the execution. I am definitely hoping that the next book is a little better than the first. The ending was kind of melodramatic, and I am not sure where Hades will pick up. If you like fallen angels series (such as Fallen and Hush Hush) this may not be what you are looking for. As bad as this may sound, I am hoping that Beth turns to the dark side; that seems like an awesome twist (:! At first, I couldn't stand the thought of another fallen angel, searching for the reincarnated soul of their human soulmate, plot. And then I realized (hoped) that Halo might be different - three angels are sent to Earth, disguised as humans, to use their good actions to counteract the forces of darkness seeping in to town. They were not meant to form attachments, and thus there could be no instant attraction, soulmate stuff, right? Wrong. Too soon the angels' original mission seems to be forgotten and all attention is focused on the budding relationship between Bethany and Xavier. It never was explained why Bethany was allowed to continue to date Xavier, considering it seemed quite taboo up until Gabriel spoke with the covenant, and Bethany seemed to completely forget her purpose on Earth as each conscious moment was consumed with thoughts of Xavier. Through all the thoughts of Xavier, I couldn't help but wonder when we would see her contribute something to the mission, some reason to explain why she was chosen. I'm disappointed (but not shocked) to report that having finished Halo, her role in the mission is never explained/justified. Instead we are forced to bear witness to Bethany's transformation into Bella. A completely spineless, uninteresting character who has no purpose to serve, no reason to live, if her boyfriend is not in the picture. At one point, Bethany mentions how Xavier has become a buffer in her life, helping her to steer clear of the things/people who would cause her harm. As an angel who was eager to experience life as a human, being unable to experience any sort of (emotional) pain seems unrealistic. And why she needs a boy to protect her is beyond me. Even though she inhabits a "frail" human body, she is still an angel with unearthly powers (though we never really get to see what hers were). I wish she had had the courage to face situations head-on, instead of cowering behind her boyfriend, relying on his strength to get her through. I wish she hadn't been so insecure, running to Xavier for comfort whenever something upset her, so he could reassure her that everything was going to be ok.
She became so melodramatic, that I almost couldn't finish the book. "Everything would fall apart; there wouldn't be anything to live for. If we end, I end." I'm surprised that Adornetto didn't use blank pages after Bethany's fight with Xavier to establish how hollow Bethany felt without his presence; that's how eerily similar Bethany became to Bella. Instead she had her sobbing on the beach, until the tide rose and almost swallowed her whole. I don't understand why love has to be so all-consuming in YA novels recently. It's not romantic to wish for death if you are separated from the one you love - I especially didn't expect that of an angel, seeing how suicide is an unforgivable sin. The most frustrating part was the continuous use of foreshadowing. "When I looked back on it later, I realized that was exactly what Jake Thorn had wanted." And it wasn't enough to end the chapter on a cliffhanger, each segue way into a new section within a chapter also had to end in foreshadowing. It was tiresome; just get to the point already. I'm not even going to get in to how overly boring the story was or how preachy Adornetto's writing was. Its just not worth my time. I did not enjoy Halo and I would not recommend it to others.